No cross re-activity, meaning no other drug will cause a false positive. Detection – cocaine is a water soluble molecule, detectable for up to 72 hours. Tests for synthetic opiods (oxycodone), a synthetic drug that cannot be detected through opiates drug test. Detection - No second hand smoke detection. 10 - 24 $0.30 ea. $1.55 ea. 25 - 99 $0.76 ea. $1.09 ea. 100 - 299 $0.90 ea. $0.95 ea. 300 - 499 $1.10 ea. $0.75 ea. 500 - 999 $1.15 ea. $0.70 ea. 1000 or more $1.20 ea. $0.65 ea. Remove the bottom cap from the single drug test card and submerge the drug test strips in the urine. 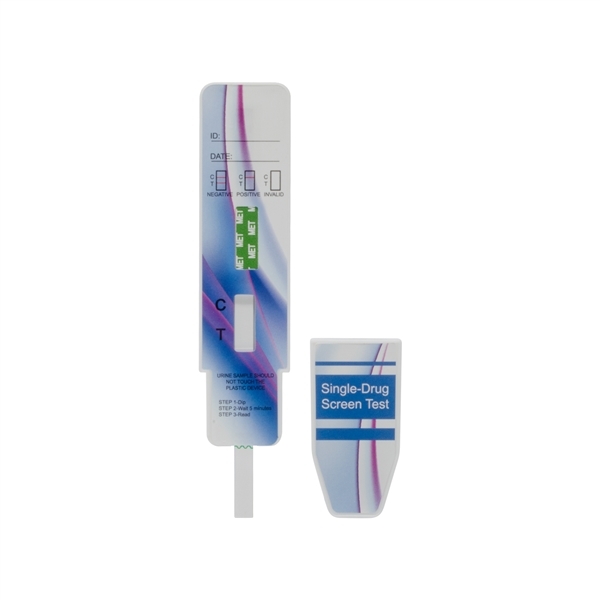 AVOID passing the arrow when submerging the single drug test card since this can flood the test and invalidate the drug test. Thank you for Quality product and quick shipping. Would think that more explicit directions on reading results would be helpful to first time users of this kind of kit, i.e. Telling them that even a very faint line on the T (test) line counts and that it may be much lighter than the C (control) line and still be a negative result and btw also that negative means drug not present in urine (or in amt needed to test positive.. And be clear that negative does not mean "fail" etc.